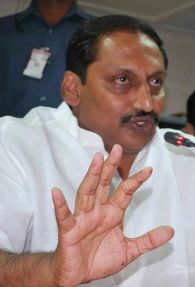 Treading a cautious path on the Telangana issue, Andhra Pradesh Chief Minister N Kiran Kumar Reddy said in Hyderabad on Thursday that the Centre should address the complicated issues concerned with the bifurcation of the state first before it embarks on the process. Breaking his silence on the Congress' decision to form a separate Telangana state, he gave out statistics and highlighted complicated issues related to water and power sharing as well as the status of Hyderabad, which would arise during the bifurcation of Andhra Pradesh. "I am not suggesting anything. I am only suggesting that all these issues connected to the people have to be addressed before we go ahead with whatever decision we want to take". "These are issues connected to the people. Without addressing these issues, we must not create bigger problems than the existing problems in the anxiety to create a state. We have to address these issues," he told reporters. "My request to the Centre or the committee, which would look into this, is that all these issues have to be addressed," he said. On Wednesday, Congress set up a four-member committee headed by Defence Minister A K Antony to address concerns arising out of the decision to create a separate Telangana state out of Andhra Pradesh. Asked if he wanted the Congress Working Committee to withdraw its decision, he said there is a need for clarity about all the issues. However, replying to a query, he also said he represented "both the regions" and that these issues concerned all people in the state. Asked whether the Congress leadership took the decision to form a separate Telangana state without taking into account the complicated issues involved, the AP CM said his party has taken the decision and that the Centre needs to move forward after giving clarity to the people. Andhra Pradesh assembly also needs to discuss the issue, he said. Replying to a query, he said he neither welcomed nor opposed the decision of the Congress Working Committee in favour of separate statehood for Telangana. Asked if he would favour it, if the Congress leadership reconsidered its decision, he said issues need to be addressed. A cabinet sub-committee would also be appointed to look into the issues concerned with the bifurcation, he said. Replying to another query, he said two members of the A K Antony committee are Union ministers and that all grievances would be conveyed to the panel. He appealed to government employees to withdraw the strike notice served by them. The chief minister also appealed to the youth not to take the extreme step of ending their lives for a "united" Andhra Pradesh. Answering a query, he said ministers submitting their resignation in support of "united" Andhra are doing so reflecting the views of people in their regions. Several ministers from non-Telangana regions have already submitted resignations and the report of one more minister (Thota Narasimham) resigning came in on Thursday. Strongly condemning desecrations of statues of national leaders in non-Telangana regions, he said violation of laws would be dealt with sternly.